Are there metal cutting guillotine blades that are of stainless steel cutting quality and don't chip? 1.) 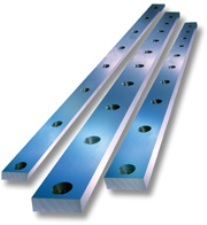 For the specific cutting of steels, up to 6mm material thickness, then we recommend your metal cutting guillotine blades are manufactured from Grade D2 material, hardened and tempered to 57/58 Rockweld to give an abrasion resistance, to increases periods between regrinds. Please Note* Because of the hardness, of 57/58 Rockweld, if you then cut stainless steel or durbar, or any other high tensile strength steel with these blades, you are risking chipping of the blades. 2.) For the specific cutting of stainless steels. Stainless steel has a higher tensile strength than carbon steels, such as 275, it is this increased tensile strength that creates the problem of blades chipping. So, there is no straight forward solution to general cutting of varied metal guillotining. Harden and temper guillotine blades to 57/58 Rockweld increases abrasion resistance, increases periods between regrinds, but the blade is more likely to chip when cutting stainless steel, durbar or high tensile steels. Harden and temper blades to Rockweld 55/56, then chipping is less of a problem, but abrasion resistance is reduced, shorter periods between blade regrinds are experienced.